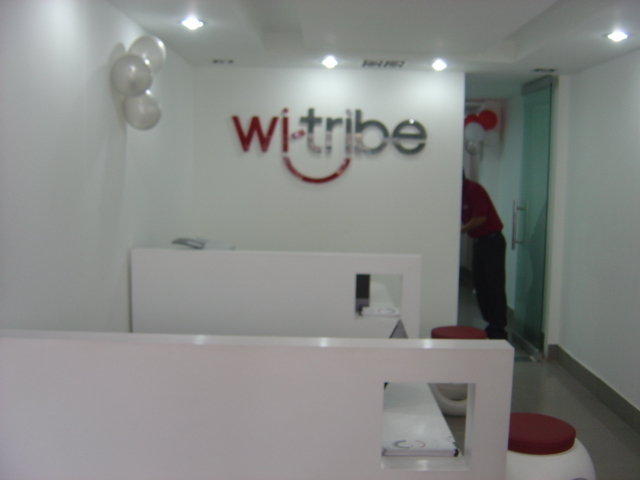 Wi-Tribe is the new kid on the WiMax block, and by the looks of it, it looks set to take over the competition, not by any eye-popping stunt or unbeatable advantage but through slowly building up customer base through unpretentious no-frills service. It may have announced its entry into the Pakistani market now, but it has been present in the market for over a year now, learning about the consumer preferences through an exhaustive research which it got conducted through Oasis International, the second largest research organization in Pakistan after A.C Nielsen. So you can safely bet that the packages they’re offering and the service they’re providing has been determined in advanced via the consumer survey. 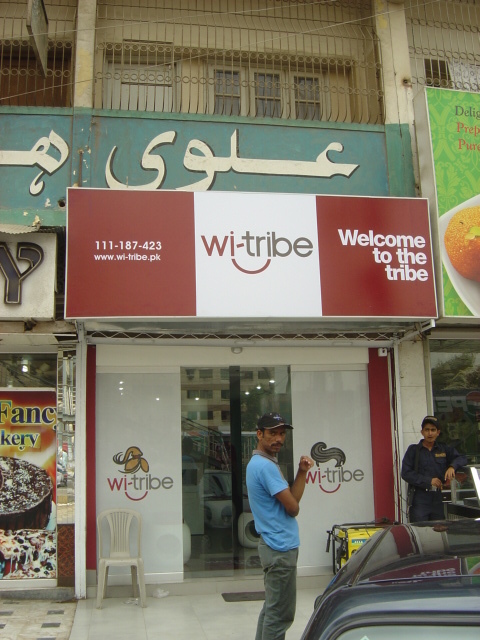 WiMax may have become the new buzzword amongst the net-savvy niche of Pakistan, but for some inexplicable reason, Wi-Tribe has decided not to use the word Wi-Max to define its service. This could prove to be either a very shrewd strategy, or a self-destructive strategy. The major reason for this is that WorldCall is offering wireless broadband service based on CDMA technology, and the service has been lambasted by most of the consumers. The website Bolta Consumer is brimming with vile for WorldCall. 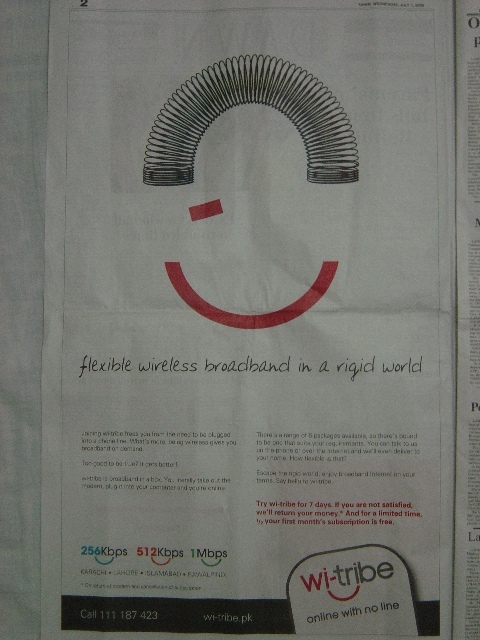 Now if Wi-Tribe is also going to brand itself as the wireless broadband with no mention of WiMax, the consumers are going to associate Wi-Tribe with WorldCall (whose reputation is already in tatters) instead of the WiMax players Wateen and Infinity. Result? Those looking for a good WiMax experience are not going to touch Wi-Tribe with a 10-foot pole even with the 7 days money-back guarantee. But why is WiTribe refraining from using the word WiMax? There can be two reasons. Either Wi-Tribe is not using WiMax technology altogether, or it wants to be associated more with the wired broadbrand service providers like PTCL, LinkDotNet and MaxCom because of their higher speeds instead of the WiMax providers Wateen and Infinity which lag far behind. The third and less plausible reason is that consumers don’t know much about WiMax. They either know wireless or broadband, and based on the results of their consumer survey, they may have unearthed some insight that ‘wireless broadband’ will sell more than ‘WiMax’. My contention is that only those consumers are going to be hitching on this bandwagon who already know something about technology and stuff, so WiMax should have been used definitely. A totally layman consumer is going to opt for the wired broadband because of the far higher value for money when you take into account the unlimited downloads feature in the wired services. Wi-Tribe’s communication strategy is pretty simple. Their TVC as well as their print ad is remarkably austere sans any animate characters or curvaceous vixens. It seems to be directed at people who already know what they’re going to get out of this service as opposed to creating awareness about the benefits that can be gleaned. 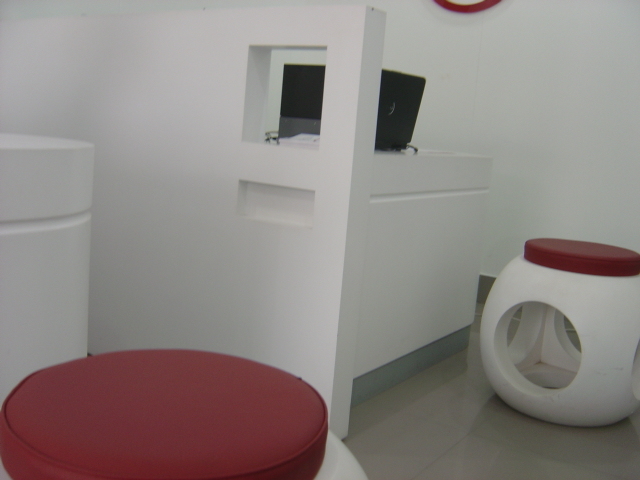 The latter model was followed by the other major broadband service providers. The best campaign was surprisingly that of the PTCL that really went full throttle in explaining what enormous advantage could be had at your fingertips by upgrading to broadband from dial-up. The runner-up campaign was that of Mobilink Infinity which again focused on the benefits part especially on the gaming segment. The worst had to be Wateen which showcased minimal benefits with no explanation. What’s worse, it showed a damsel just fooling around with a purse in hand, as if that it would help the consumer get a clearer picture. Later on they took Shehzad Roy as their brand ambassador, but that was a bit too late and definitely not the best of decisions. Wi-Tribe’s radio ad, however, is a different story altogether. It depicts a guy hanging out with a laptop on his rooftop gazing at the stars (and into the neighboring houses probably). This communicates not only a benefit but a clear-cut lifestyle positioning. Who knows, maybe this would spawn into a fad where everyone cat and dog is perched on the rooftop with a laptop. In addition to all this, it is following the hackneyed strategy of sponsoring shows, both on television and radio. 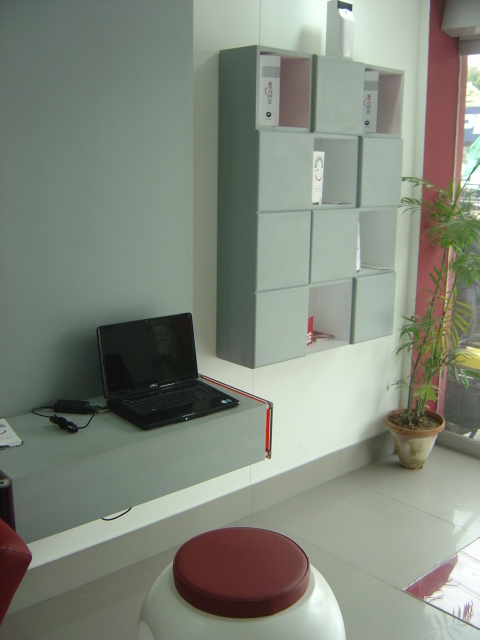 A visit to one of their outlets projects the same simplistic image, but elegant. Even if their sales team seems to be devoid of any pretense. Their sales rep I interacted with was one Fahad Khan. Amongst the many things he revealed was the policy of the company to refrain from aggressively pursuing and closing the sales. If a particular area didn’t have sufficient strong signals of Wi-Tribe, the company would refrain from providing the connection lest the service quality and hence the image of the company suffers. For instance when asked if SITE area was covered by Wi-Tribe, he immediately replied in the negative without beating about the bush. When asked why the company had avoided using the word WiMax in its communication strategy, he replied they had decided to focus on the broadband aspect rather than the WiMax aspect. Other than that, he didn’t exactly know the underlying reason. 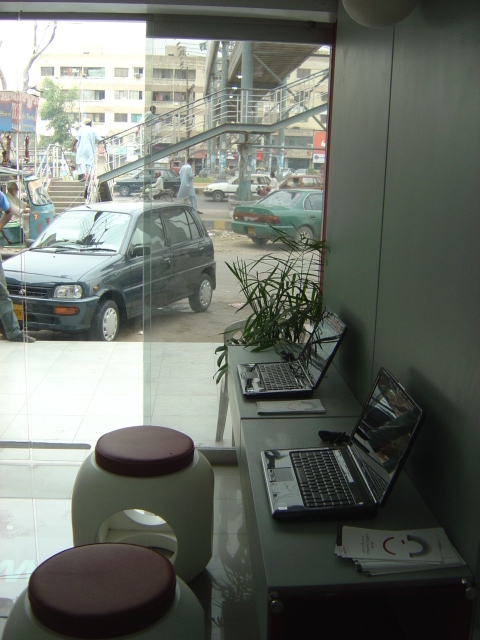 One other thing he revealed when asked about how their service compared to the existing WiMax players is that although Wi-Tribe has one-third the capacity of Wateen, their coverage was comparable to it. While Wateen was using 168 towers to provide coverage, Wi-Tribe was using 172 to cover the same area. This was to ensure that the signal strength didn’t drop so much that the users had to suffer. One striking thing was that the rep was friendly in addition to being professional, willing to discuss things other than business. His sales team had a night match scheduled for that night which the sales manager had proposed and would include all the sales reps. A happy Tribe? Seems that way. Right now it looks Wi-Tribe is the cheapest kid on the WiMax block in addition to being the new one. What’s more, it’s not offering the moon to the consumers contrary to the other WiMax players. Its unique USP is that in addition to positioning itself as the cheapest, it is offering 7 days money-back guarantee to back up its claim of being a reliable connection. It’s not asking even for the security deposit which both Wateen and Infinity are demanding. Another differentiation, however minor it may be, is that Mobilink Infinity and Warid Wateen are forcing you (there’s no other way to put it) to make use of their voice capabilities. 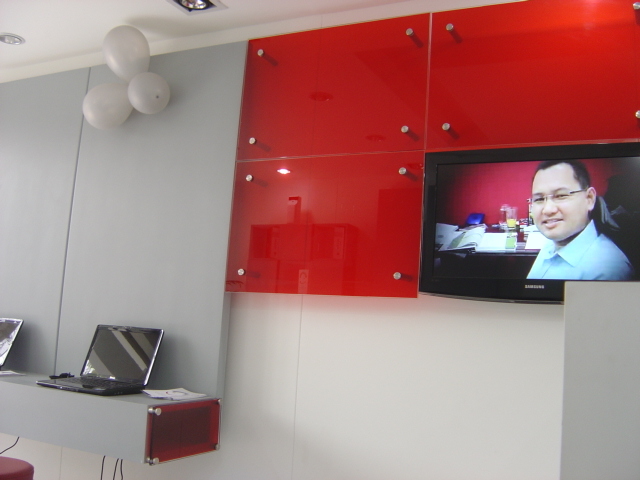 Although it includes a number of free minutes, you have to pay the line rent for that whether you like it or not. According to Fahad, Wi-Tribe is not offering the voice facility currently, and when it will, it wouldn’t make it mandatory on the consumer to buy it. Remains to be seen. Wi-Tribe is all set to rock the WiMax boat, offering great speeds at the lowest possible price and then backing the claim with money-back guarantee. The only thing left to seal Wi-Tribe as the undisputed champion of the wireless world is go ahead and take it for a spin. A friend of mine did try to take it for a spin. He called their number and verbally applied for the connection. 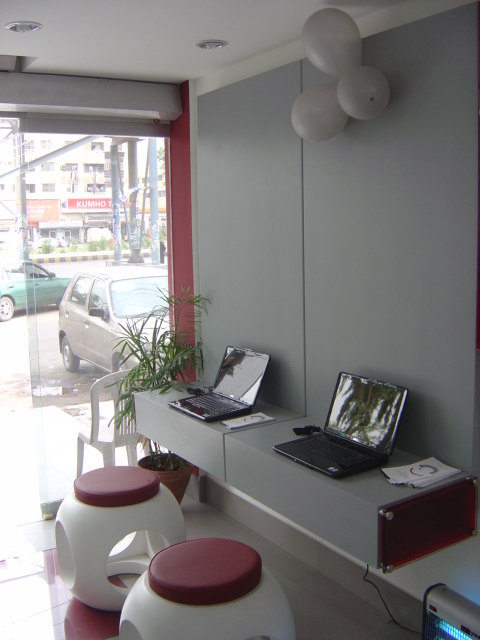 Their tech guy who happened to be sitting in Islamabad informed my friend that his area didn’t have proper coverage of Wi-Tribe as yet, and since Wi-Tribe signals weren’t strong enough in his area, the techie guy refrained from offering the normal service, saying this would result in a poor connection that would reflect badly on the image of the company. He in turn offered the solution of installing an external antenna which would require a Rs. 2,500 security deposit. Furthermore, my friend would have to buy the 1Mbps package. He refused this solution and instead went for Mobilink Infinity which would have cost him almost the same but since it has been in the market for some time now, its performance is proven and verified by the consumers. Unfortunate for Wi-Tribe to lose a customer like that to Infinity. Still, it has got all the time in the world to dominate this market, which remains largely untapped. 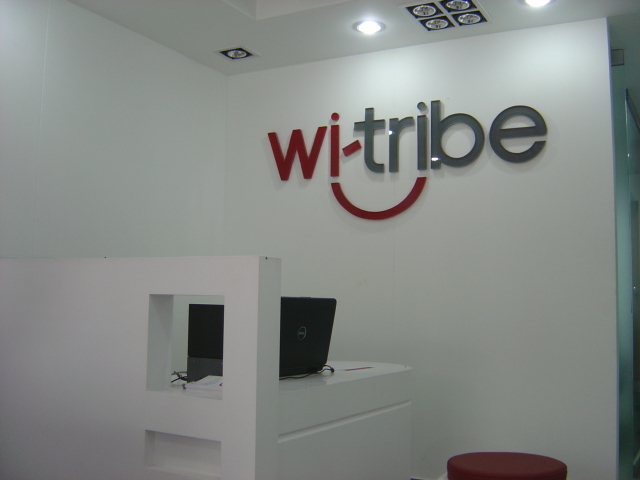 So Wi-Tribe has taken over the position of the lowest-cost wireless service provider. What other USP is left for a new competitor or even one of the existing ones to use?